Is Le Guen the best man for Cameroon? LONDON, England (CNN) -- International friendlies are not always the most testing of football matches but for one French coach the challenge of his first game in charge could set an important marker in a crucial year for his side. 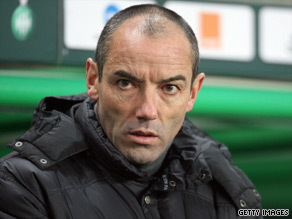 Paul Le Guen has become the fifth European to take charge of Cameroon since 2004. Paul Le Guen, after guiding French side Lyon to three consecutive titles from 2003 onwards, opened a new chapter in his career when he became the new coach of Cameroon in July. The 45-year-old Frenchman -- who will lead the side known as the 'Indomitable Lions' for the first time against Austria -- follows in the footsteps of Winfried Schafer, Artur Jorge, Arie Haan and latterly Otto Pfister to become the African nations fifth European coach since 2004. In a year when Cameroon -- traditionally one of Africa's strongest sides -- are struggling for form in their bid to qualify for the 2010 World Cup finals and Africa Cup of Nations, Le Guen has much to prove. Especially as the decision to use European coaches over those who are home-based is increasingly controversial. The appointment of the former Paris St Germain boss by Cameroon is the 25th time a European has taken charge of a national side in Africa, and of the 55 Confederation of African Football (CAF) members only 18 of those countries - many of who are towards the lower end of the rankings - have indigenous coaches. Undoubtedly the recent inclination in African football has been towards to European coaches - but questions marks remain over whether they are always the best choice. Nigeria turned to former Germany coach Berti Vogts in January 2007 to lead the Super Eagles. Twelve months later, aggressive criticism in local media and a poor showing at the Africa Cup of Nations ended the German's short tenure. The Nigeria Football Association consequently returned to their policy of employing homegrown talent when Shaibu Amodu was handed the reins. Egypt - under native Hassan Shehata - have also shown recently that coaches who cut their managerial teeth domestically can deliver success on the international stage. Shehata steered his side successfully defended their Nations Cup title in 2008 before recording a memorable 1-0 win over Italy at the Confederations Cup in South Africa. Additionally, native Luis Oliveira Goncalves took a modest Angola side to the 2006 World Cup where he finally received the plaudits for years of unsung work. World Soccer writer Mark Gleeson, an expert on African football, believes that the policy of hiring European coaches rather than homegrown ones is reflective of a trend of football as a whole and not unique to Africa. He told CNN: "Ultimately the various associations want to recruit what appears to be the best candidate available and just as the English Premier League has a number of foreign coaches so a similar situation exists in African football. "As long as the candidate is the right choice - and is coming with for the right reasons, with the right mentality - it can really benefit a country's football development. But if that's not the case it can end badly. "It is crucial that the person who comes from Europe in particular has the right personality as well as the coaching credentials as the job can be quite challenging. "Paul Le Guen is into Africa for the first time so he will probably want to bring his backroom staff and people although the Cameroon FA would probably want to have some of their own people involved. "A European coach can often divide opinion among the fans and perhaps a homegrown coach might get a little bit more time and patience from the supporters so they are not always the right choice." Gleeson also admitted that the process of appointing a coach is not as straightforward as it is elsewhere which and sometimes hinder the chance of homegrown managers getting the job. "There can be a lot of politics with certain associations when a country looks to hire a new national team coach," he added. "The fact that Paul Le Guen was officially appointed by the sports minister rather than the Cameroon FA gives an indication of the way that things operate differently in Africa. "A sports official may have their personal preference for a job and they may want a marquee name with more glamour attached to it rather than an adept local man."